Today is Dec-2015 Expiry Day Please Close All Trades – Note that all ITM (In The Money) Options and ALL Futures contracts for DEC-15 expiry SHOULD be CLOSED today before market closes for trading preferably before 3.15 pm. If you do not close, your broker may close it at market rates anytime between 3.15 and 3.30 pm. And if they forget to close then you may have to accept rates given by NSE/BSE and it is NOT good to accept “whatever” rates thrown to you. It is always better to take risk off your hands and know the exact profit/loss made by you before markets closes. So please close all In The Money (ITM) Options and Futures contracts expiring today before 3.15 pm. Of course if you have sold options that are currently Out of The Money (OTM), then to save brokerage you can leave them to expire worthless. Compare 24% to NEGATIVE returns and you get the point. For me at least its more than enough. If you are slightly intelligent in Finance – you should understand that making 24% a year is GREAT RETURN. If you do not know, FIIs (Foreign Institutional Investors) will be VERY HAPPY with a 10% return a year because in America they get ZERO returns if they keep cash in their banks. 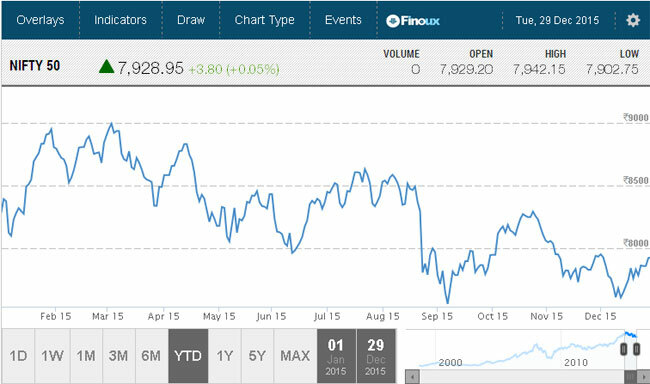 Even FDs there give near ZERO returns – I think its 1% a year. Of course inflation is also ZERO. So a 10% return is 10% more than Inflation – which in their country is a great return. Strangely in India people think trading options means “trade with few thousands and make crores in a few years”. Yep and they lose those few thousands in no time. 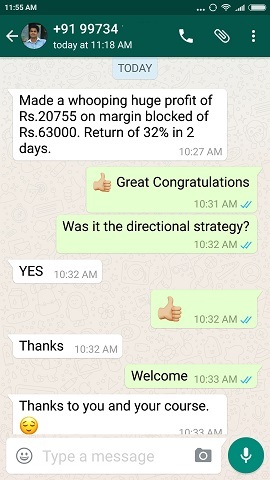 For example someone searched for â€œhow to earn 1 lakh per month from share market investing 10000â€ and landed at my page: How to make crores from the stock markets. 🙂 How is that even remotely possible? 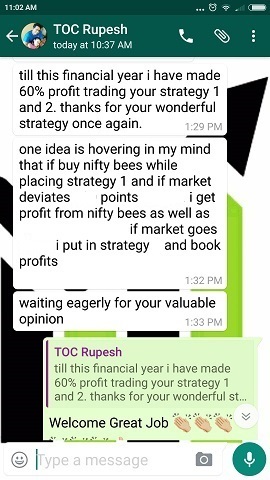 If you are losing money chasing such dreams than chances are it is really a costly dream and you must have lost lakhs looking for that “amazing strategy” which NEVER makes money in real trading world. Like real life is very different than “reel” life, its easy to dream making millions from the stock markets with only a small investment in couple of years. We all want a life like those hero in the films, in reality they themselves do not live such kind of life. So please be realistic – do not buy dreams. Interestingly, I have experience even there. 🙂 From 2007 to 2010 I did very aggressive trading. The idea was to double my 5 lakhs every year and make it over 1 crore in 5 years. If correct I would have made 1.6 crores. 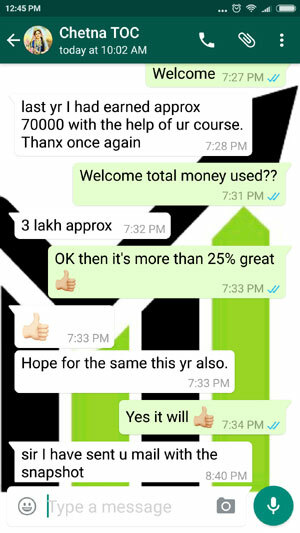 The result – I LOST 5+2 LAKHS IN MY QUEST TO DOUBLE MY MONEY EVERY YEAR. And to rub salt in my wound – I had to take a personal loan to survive. Well whatever happens happens for good else this website wouldn’t exist. 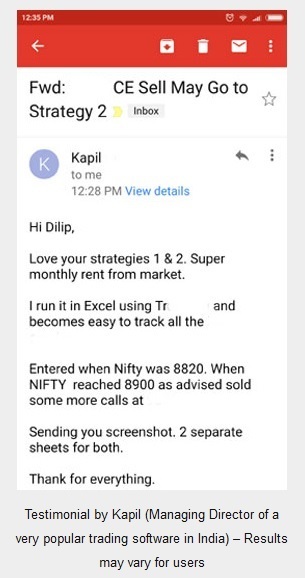 Do not do my course if you think 3% a month is too low a return, but please also DO NOT waste your hard earned precious money on people who sell you dreams of great returns from aggressive trading. They will charge you heavily and you will lose money trading their tips and on top of that they will not pick the phone after you lose money. Please DO NOT let that happen to you next year. 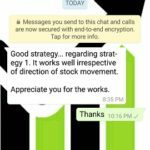 Just DELETE those SMS – they are not worth your time and money. All The Best For 2016. Please trade sensibly and everything will be fine. If you think 3% a month is a good return, my course can help you achieve that. Read about it here. 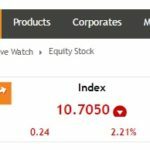 How much money you lost trading this year and why? Wishing You and Your Family A Very Happy New Year 2016. Thank You Mr. Vijay and same to you.